Polish - Describes the smoothness of the diamond's facets. With poor polish, the surface of a facet can be dulled, and may create a blurred or dulled sparkle. Symmetry – refers to alignment of the facets. With poor symmetry, light can be misdirected as it enters and exits the diamond. Price per carat – price per carat is a good way to compare the costs of similar diamonds. Divide the cost of each stone by its carat weight to calculate its price per carat. Fluorescence - Diamonds tendency to emit a soft colored glow when subjected to ultraviolet light, such as a "black light". Fluorescence has a negative impact on colorless diamonds, making them appear cloudy. Fluorescence can occur in different intensities. GIA rates the fluorescence of each diamond on a scale from "None" to "Very Strong". What is a Certificated Diamond? A diamond certificate (or diamond grading report) gives a diamond’s exact measurements, clarity, color, polish, symmetry, weight, cut and overall quality. A certificate will precisely point out a diamond’s individual characteristics and can be a useful tool when identifying a stone. A certificate is not the same as an appraisal since a certificate has no written monetary value of the stone. A diamond certificate is issued by an accredited independent gemological laboratory, such as Gemological Institute of America (GIA) or American Gem Society (AGS or AGSL) to name a few. GIA is considered the industry standard because of its reliability and consistent grading. One of the more common GIA reports is the full issued document, which contains the complete description of the diamond, as well as a plotting of the natural inclusions or flaws, blemishes, air bubbles and cracks within the stone. 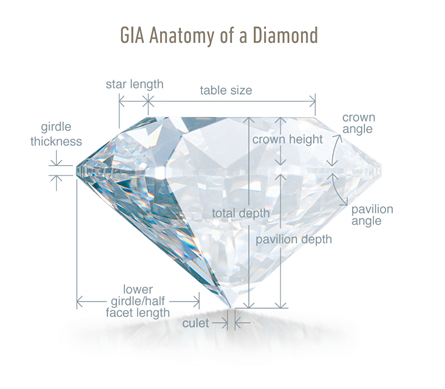 The GIA Dossier, which is a summary of the diamond’s features, will have the full individual details of the diamond grade, but the plotting is not included. AGS, grades on eight aspects of the cut for each stone it analyzes. The aspects include the Crown & Pavilion Angle, Pavilion Depth, Table Diameter, Girdle Thickness, Culet Size, Polish, Symmetry and Performance. The first five of these aspects are grouped under the term ‘Proportion.’ AGS gives its highest cut grade to a stone that has achieved the maximum score on all four criteria: Polish, Symmetry, Proportion and Performance. An important fact one needs to remember when obtaining a certificate from any independent gemological laboratory is that a trained diamond technician is analyzing each diamond, thus using their subjective opinion on how a stone should be graded. For example, if the same stone is sent back to the laboratory three times, three different reports may be issued. All three grades will be similar, but there will be subtle differences between each of the grading reports.